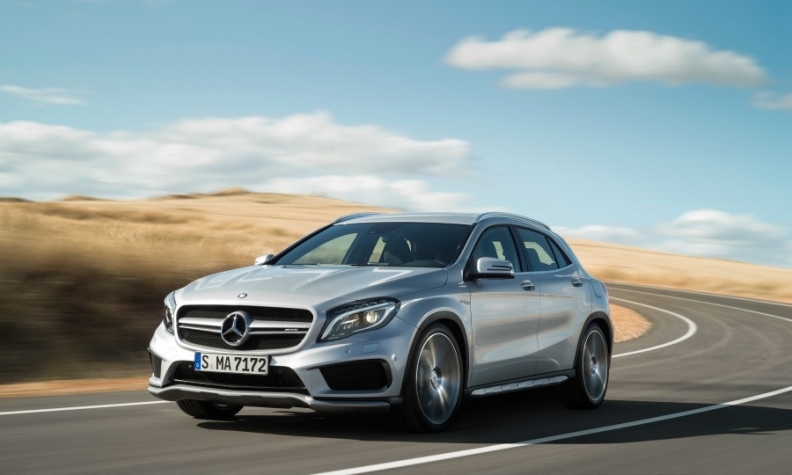 Mercedes may offer a hybrid 3-cylinder engine in compacts such as the GLA (shown). Mercedes-Benz will use three-cylinder engines for future hybrid versions of its compact front-wheel-drive vehicles, according to Bernhard Heil, head of powertrain development for parent company Daimler. While Mercedes' engineers are not convinced that three-cylinder engines are a good idea on their own, the engines' small size will be needed for transverse-mounted hybrid powertrains. "In packaging a hybridized engine in the front end, the four-cylinder engine has its limitations," Heil said in an interview. Daimler's rear-wheel-drive vehicles will stick with four-cylinder engines and up -- even the hybrid derivatives -- because there's more room in those cars for longitudinally mounted engines. Mercedes' C class, E class and S class are designed to accommodate bigger engines, and a hybrid combined with a four-cylinder engine does not present packaging problems. Heil said Daimler also plans to market a small gasoline engine developed jointly with Renault. Mercedes-Benz already offers a Renault-sourced, slightly tweaked 1.5-liter turbodiesel in compact cars sold in Europe. Both the three- and four-cylinder engines being co-developed with Renault are designed to fit into the compact A class, B class, CLA and GLA. The debut of the engines is understood to be at least two years away. It is not clear whether they would be offered in the United States, since U.S.-bound models typically are fitted with the most powerful engines in Mercedes' portfolio.